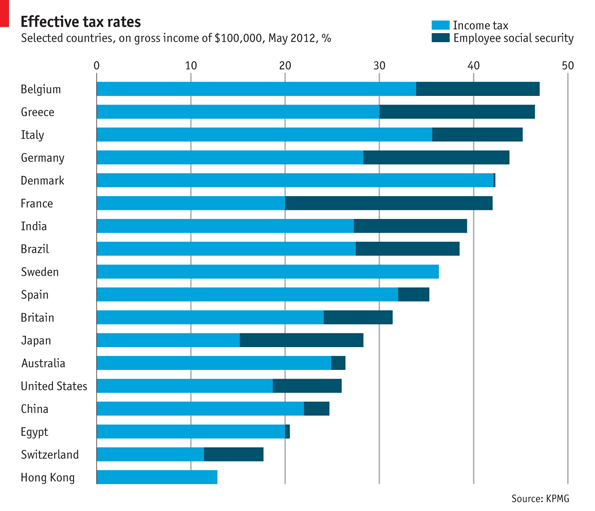 Hong Kong and Switzerland are attractive with relatively low effective tax rates. Many international corporations have relocated to these two countries the last decades. The worst ones are Greece, Belgium and Italy. We expect both people and corporations to continue to flee these countries the coming years. Zug, Switzerland: Developed nations from Japan to America are desperate for growth, but this tiny lake-filled Swiss canton is wrestling with a different problem: too much of it according to Deborha Ball in Wall Street Journal. Zug’s history of rock-bottom tax rates, for individuals and corporations alike, has brought it an A-list of multinational businesses. Luxury shops abound, government coffers are flush, and there are so many jobs that employers sometimes have a hard time finding people to fill them. Before Zug became Switzerland’s premier spot for the wealthy and corporations it was known for its picturesque views along the lake of the same name. If Switzerland is the world’s most famous tax haven, Zug amounts to a haven within a haven. It has the highest concentration of U.S.-dollar millionaires in Switzerland, a country where nearly 10% of households meet that standard, according to Boston Consulting Group. The highest personal income tax anyone in Zug has to pay is 22.9%, and companies pay an average of just 15.4%—rates lower than Switzerland’s average and far below top rates in the U.S. Thanks in large part to such policies, Zug now boasts the headquarters of big companies ranging from construction firm Foster Wheeler Ltd. to commodities trader Glencore International PLC, and branches of many more. When Transocean Ltd., a drilling contractor known for its tax planning, decided two years ago to move its headquarters from the Cayman Islands and Houston, it picked Zug. But lately, the place has become something of a victim of its own success. It is grappling with the consequences of the wealth it has attracted, now crowding out the non-rich and squeezing companies looking for space and talent. But when Stefan Hurschler, a man who works with the disabled, and his schoolteacher wife decided to expand their family and wanted a bigger house, they found nothing in Zug they could afford. They moved to Zürich, and Mr. Hurschler now commutes back to the town he grew up in. “There are older people who still live [in Zug] because they bought their homes in the 1960s,” said his wife, Lilian. “Or there are the very rich. But there isn’t much of a middle class.” Here is a link to the full story. Switzerland said it will make it easier for foreign governments to hunt for tax cheats with Swiss bank accounts, amid continuing criticism that it still does too little to assist international tax authorities, even after years of pressure to ease bank secrecy. The Swiss Finance Ministry said Tuesday that Switzerland will provide information on holders of bank accounts if foreign tax authorities provide just the bank account number or other information, such as a Social Security number or credit-card details. Until now, the Swiss demanded full bank account details, as well as the name and address of the individual. Also remember that Switzerland accepts foreign countries court decisions. However, there are attractive alternatives. We have a global approach and can help you, contact us if you need advice regarding your private banking and/or your business banking. After a tough political battle, fraught with tension and speculation, Switzerland’s National Council and Senate have finally united in their decision not to subject the UBS agreement to a national referendum. The landmark victory comes as the National Council, the country’s lower house of parliament, yielded at the eleventh hour, and followed the advice of the conciliation group (comprising 13 members of each council) set up to resolve the highly critical issue. Marking a significant u-turn, the lower house voted by 81 votes to 63, with 47 abstentions, against a referendum. An agreement was eventually reached thanks to the decision by the Swiss People’s Party (SVP) to reverse its previous stance and to approve the treaty in order to prevent its collapse. Failure by the National Council to comply with the conciliation group’s recommendations would have resulted in an end to the agreement. As a result of parliament’s decision to give the green light to the agreement, the Swiss Federal Council will now be able to assist US authorities under the terms of the agreement by August 19. Concluded in August last year, the agreement provides that UBS is to disclose to US authorities the names and bank details of 4,450 of its American clients, suspected of evading taxes over a number of years with the help of the Swiss banking giant. In return, civil charges against the bank will be dropped.